Testimonial videos offer a human side to the company and relate emotions through experience. The linking between what potential clients is looking for and the person who has experienced it from their point of view can be the deciding factor. Getting information from people within the company has its benefits but getting beneficial information from someone like them goes a lot further. These video testimonials can also be used as research for the company to understand how their products have affected people’s lives be it positive or negative as well as the many details that can be improved on or highlighted. Producing testimonial video as a promotion format should be broken down in the same story arc as any script. Establish a place by stating who the individual is, explain the problems they faced, and complete it with a solution by describing how the difficultly was resolved with the product. They can always be spiced up with sound effects and video reenactments or creative editing by multi-angle camera setups in the interviews. Adding a musical score that lets the viewers feel a sense of danger during the conflict and a soothing music that plays once the problem is resolved is also a brilliant way to shed optimal light on the story line. The old adage “the proof is in the pudding” really comes true with this as 90% of marketing professionals agree that video testimonials are the most effective at converting leads into sales. The mere use of the word “video” in an email almost doubles click rates and reduces unsubscribing rates by a quarter. Plus, testimonials are often much cheaper to produce than scripted productions with hired actors. It’s certain that many of your customers would love to be part of a video testimonial as they might have a huge affection for your product and an interesting way of phrasing their opinion. Also, average people want the chance to be on camera and be seen. Doing that at a professional level with an actual production team will really make their day and leave them praising this experience and your company with word of mouth advertising for years to come. Testimonial video provide crucial research for your product development and marketing department. They give an opportunity for real client to communicate their experience and be part of the team. 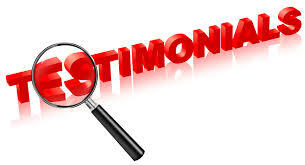 Every testimonial will show potential client how and why your product can be appreciative addition to their own lives in a way no artificial story line can.